Your "why." The most important question. Why do you want to work for yourself? Whether it's a service, a product, or your insight or expertise, you already have the raw materials necessary to transform your life. Carrie will walk you through the process of building the business you need to achieve the life you want. Her guidance is practical. No philosophical silliness, no theoretical abstractions- just concrete action steps alongside insights from fellow entrepreneurs, interactive exercises, and links to Carrie's online video coaching segments. It's the next best thing to working one-on-one with her. 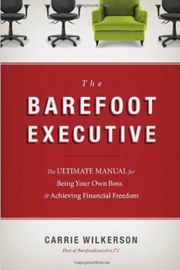 The Barefoot Executive will have you energized by the possibilities and embracing the extraordinary life that is well within your reach. DISCOVER what you already have to offer, how to use it to your advantage, and where to find the people who are eager to buy it. The Barefoot Executive will pull you over the hurdle of uncertainty and get you moving, planning, doing. "One of the best ways to achieve success is to learn from someone who has already done it. If you are looking to build a viable, sustainable, and lucrative business from home- or anywhere else- Carrie Wilkerson is your example, and her new book will show you the way." - Tim Sanders, author of Today We Are Rich and former CSO at Yahoo!